HomeTowne Auto Repair and Tire does wheel alignments on vehicles of all years, makes and models both foreign and domestic, including your Honda! Our Virginia roadways are inundated with potholes and rough roads, so it’s very likely you will need to have a professional wheel alignment done on your Honda at least once a year. Our winters have been treacherous and there has been a multitude of the “white stuff” coating our roadways throughout our long and cold winter this year. 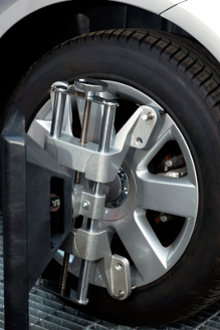 Your Honda contains a complex suspension system, and there are quite a few circumstances that can cause your vehicle to require a wheel alignment. In some instances it could be normal wear and tear on the parts of your Honda’s suspension system. Or perhaps you hit a curb, speed bump or pothole which knocked your Honda out of alignment. During a wheel alignment your vehicle’s steering wheel is placed at its center position, and then the wheels and axles are adjusted to an angle specified by the manufacturer so they are parallel to one another. Without this vital service, you may have noticed that your vehicle will pull to one side, or that the tires on your Honda are wearing unevenly. Ensuring that your vehicle is properly aligned will save you money on tires, and increase your Honda’s gas mileage.